I’m the Learning Officer for museums in South Tyneside working with Arbeia, South Shields’ Roman Fort and South Shields Museum & Art Gallery. Myself and the team work with many different schools and community groups using the museum collections, and engage with people from all over our local community. It’s an aspect of museum life that not everyone is aware of. I wanted to share the legacy of a trailblazing project we were involved in a few years ago with Kings College London, which has developed into a resource website for other educators. My primary school is at the museum is an action project which was developed by the Cultural Institute at King’s College London against a backdrop of threatened museum services, a shortage of school places, and ever growing evidence to support the range of benefits of learning in cultural environments and through collections. 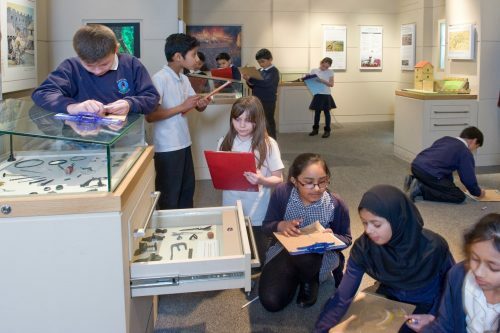 It involved placing three primary schools from around the UK in a museum setting for between two and five weeks in 2016. 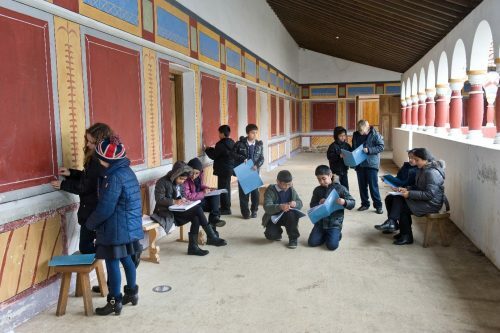 At Arbeia we were delighted to be involved in the first pilot with the ever enthusiastic Hadrian Primary School across the road from the museum, with whom we have a fantastic relationship. We were very excited, but not really knowing of what exciting developments would open up before us as we tested the benefits of co-locating their year 5 (ages 9 – 10 years) primary school class for a term within our museum. In short – the children used the museum as their classroom. The aim of the blog is to become a one-stop shop for resources relating to the project, and anyone looking for more information on a museum residency.